ENTER TO WIN $500 TO SPOIL YOUR SWEETHEART! February is the Month of Love and to show how much we love you, from February 4, 2019 – March 1, 2019 we're giving away $100 a day, and 4 GRAND PRIZE WINNERS will receive $500 and a night out with their sweetheart! 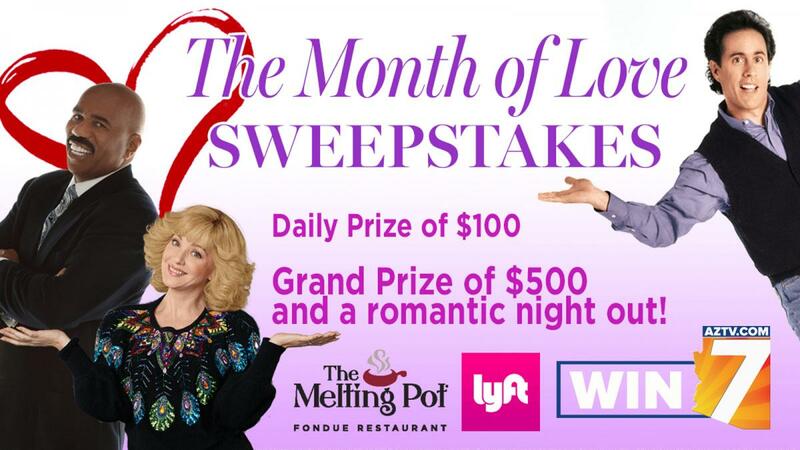 Brought to you by The Melting Pot and lyft! Look for the unique codeword in The Goldbergs at 6p, Family Feud at 7p and 8p, and Seinfeld at 9p for your chance to ENTER 4 TIMES A DAY! *HINT - The CODE WORD will show up in the first 10 minutes of the show! • Go to aztv.com/win and fill out a contest entry form for each unique codeword. • Enter up to 4 times each day during the Sweepstakes window (February 4, 2019 – March 1, 2019) to increase your chances to win. • Winners will be randomly selected by KAZT sweepstakes software. Official Rules – No purchase necessary to enter or win. Void where prohibited. There are twenty (20) daily winners of $100. Four (4) grand prize winners will receive: $500, a $200 gift certificate to The Melting Pot, $100 of transportation provided by Lyft, flower arrangement, and an AZTV prize pack. Each grand prize valued at approximately $1,000. Beginning Monday, February 4, 2019 at 6:00pm (Arizona Time) until 10:00pm on Friday, March 1, 2019 at 12:00am (Arizona Time), watch The Goldbergs at 6/6:30p, Family Feud at 7/7:30/8/8:30p or Seinfeld at 9/9:30p, Monday - Friday for the daily code words. Enter each day during the Sweepstakes window to increase your chances to win. Limit one (1) entry per day, per valid email address, per eligible person, per valid code word. You must fill out a separate entry form for each code word. All eligible entries are entered to win the daily prize and one of the weekly Grand Prizes. The daily winner will be drawn by 6:00pm the following day after a code word has aired. Winners will be contacted by phone between 9am – 5pm Mon-Friday. Friday night’s entry/winner will be contacted on the following Monday. Winner must have or create a Lyft account in order to redeem free roundtrip travel portion of the prize. Winners that do not answer their phone when we call, they will be contacted by the email on their entry form. Winners have until March 8, 2019 to claim their prize or they forfeit their prize. One entry per valid email, per eligible person, per day. Gift Certificate for the Melting Pot cannot be used February 14 - 16, 2019.